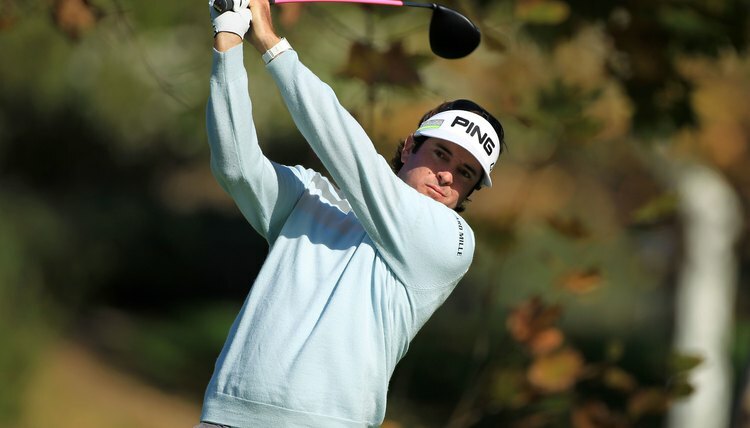 When you create as much ball speed as Bubba Watson, you need a very stiff shaft. Finding the perfect shaft flex for your golf swing used to be a case of trial and error. Today, with computerized launch monitors available in most areas of the country, it has truly become a science any player can use. Shaft flex and ball speed are closely related in a variety of ways. Understanding these interrelationships can help you see how ball speed affects shaft flex, and vice versa. You may be used to thinking only in terms of clubhead speed. If you know your clubhead speed, it can help you choose the right equipment. Manufacturers often use clubhead speed to categorize their products. The different technologies used to make golf equipment can affect how clubhead speed is transferred to the ball. United States Golf Association test results indicate its regulations are holding ball speed to around 1.5 times clubhead speed, as of the time of publication. The most useful number to know is your ball speed when you hit a driver. There are five common shaft flexes. From least to most flexible, they are extra stiff (X), stiff (S), regular (R), senior (A) and ladies (L). Oddly enough, these are not hard and fast measurements; the actual stiffness of a golf shaft can vary from manufacturer to manufacturer. Some manufacturers try to solve this inconsistency by using a numbering system based on shaft frequency. The numbers range from 7.0 (X) to 3.0 (L), with 5.0 being a regular flex. Most charts used to determine the best shaft flex for a particular golfer use clubhead speed, not ball speed. Use the 1.5 relationship to find the approximate ball speed created by each shaft flex. If you don't hit the ball solidly, the relationship between your ball speed and shaft flex can be skewed. When USGA testers measure ball speed, they use a mechanical golf-ball hitting machine, often referred to as "Iron Byron," to create the consistent strikes necessary to fairly make the comparison between clubs and balls. If you don't hit the ball squarely, you may introduce extra side spin and backspin into the equation that reduces your ball speed, even if you swing a very stiff shaft at a high club speed. Your swing motion also can affect which flex you should use. Since ball speed is proportional to clubhead speed, industry charts clearly indicate that a stiffer shaft creates a higher ball speed. The Golfsmith reference below contains a sample of such a chart. However, computer analysis using footage of legendary golfer Bobby Jones indicates this relationship between ball speed and shaft flex may not be quite as clear as it sometimes appears. Jones' clubhead speed was measured at 113 mph – a ball speed of around 166 mph – even though he was using the extremely flexible hickory shafts of his time. His swing was built around those flexible shafts. The way you swing is probably the most important link between your ball speed and your shaft flex. USGA: Do Long Hitters Get An Unfair Benefit? PGA.com: Why Get Custom Fit for a Driver?